Listen to the bearing, start lubricating and determine when to stop! The Ultraprobe® 201 Grease Caddy is uniquely designed to allow an operator to si­multaneously lubricate and monitor ultrasound levels to prevent over-lubrication. As lubrication levels fall, friction levels rise, producing ultrasonic waves, which are very directional and localized. 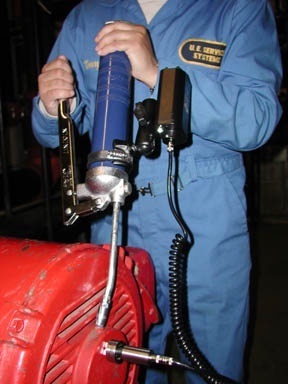 Easily attached to most standard grease guns, or worn in an optional belt holster, the Ultraprobe® 201 Grease Caddy translates high frequency sounds into the audible range, where users will hear and recognize bearing sounds. The Ultraprobe® 201 Grease Caddy focuses in on these sounds – even in the noisiest environment – and helps users identify when to stop lubricating. This unique instrument will give you control over your lubrication practices! Grease Caddy housing with LED display, headphone & battery charger receptacle, sensitivity dial, built in front end light & battery indicator. All Ultraprobe instruments are CE approved. Warranty 1-year parts/labor standard. 5 years with completed warranty registration card. Wireless Bluetooth headset with transmitter for use in high noise environments. Acts as hearing protection device. Convenient for use with hard hats. Velcro loop head band adjusts for all sizes. Made from a durable materials, easy to clean, to store & carry your grease gun with pockets for all the Grease caddy items. Ultrasonic test point complete with epoxy kit. Magnetic RAS or Stethoscope targets for permanent installation insuring consistent test point target.